Mount Fuji will soon be without snow, though such climate-related perturbations are not new to this country of several recent extinctions, including the Pungitius sinensis, Minami-tomiyo, a freshwater fish last seen in a creek in Kyoto in the early 1950s. But, it is the moss species that DSF recently sought to document photographically and scientifically for Sanctuary. 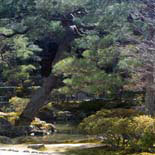 Moss in Japan holds iconic value for the Japanese the way a Giant Panda does for the Chinese. At the many moss temples throughout the Kyoto Greenbelt, such as Saiho-ji, Ryoan-ji, Ginkaku-ji, Manshuin, Kingkaku-ji and Sanjen-in, centuries of protection have created a striking challenge for future environmental policies in the country. While some Japanese continue to slaughter whales, and the nation as a whole consumes vast quantities of fish, the monks and garden practitioners sustain an aesthetic orientation to nature conservation that has few rivals anywhere on earth, a tradition dating back to the world’s first gardening manual, the Heian period Sakuteiki, by Tachibama Toshitsuna. With the assistance of Conservation International Japan and two of Japan’s leading bryologists, Dr. Yoshitaka Ooishi, a young Ph.D. from the Laboratory of Landscape Architecture, Division of Forest and Biomaterials Science in Kyoto, and his teacher /mentor, the famed Dr. Hiroyuki Akiyama, a scientist with the Museum of Nature and Human Activities and the foremost expert on Japanese moss, DSF recently documented some of the dominant species of moss across Kyoto. Moss may well prove, like amphibians, to be indicator species sensitive to climate change. Ironically, in the hundreds of tranquil gardens throughout Japan, and particularly across Kyoto – whose very name signals the crisis of global warming and humanity’s struggle to curb greenhouse gas emissions - moss species lie at the very heart of an aesthetic revolution now at risk. Indeed, at Saiho-ji, the decline in resident moss species’ diversity appears to be occurring with quite unexpected rapidity. were known to be “32 Critically Endangered and Endangered species” throughout the country’s 370,000 square kilometers. Japan is one of the newest designated “hotspots.” Will the nation’s 127.5 million residents find the tools to save what’s left? We hope the work by scientists like Dr. Hiroyuki Akiyama will help pave the way for a better understanding of the fragility of nature, as has been so magnificently portrayed in Japanese art, literature and in the spiritual gardens themselves.